Like Champagne, sparkling wines such as cava and Prosecco are great with all kinds of food, but they’re simpler, fruitier, more easygoing. F&W wine expert Ray Isle and test-kitchen pro Marcia Kiesel explore the pairing possibilities with half a dozen supremely delicious chicken recipes. Rosé sparkling wines tend to be fuller-bodied and more fruity than white ones. They are usually made by adding a small amount of red wine to white before secondary fermentation (the additional fermentation in the bottle that produces bubbles). 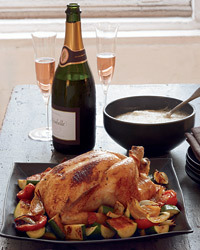 Since they’re robust, rosé sparkling wines go well with dark meat like chicken thighs or rich Mediterranean flavors. Look for the 2005 Marquès de Gelida Cava Brut Rosé Reserva ($16), the 2005 Llopart Rosé Brut Reserva ($20) or Schramsberg’s Mirabelle Brut NV ($25). Italian Prosecco’s lemon-lime flavor is great with Asian dishes. Try Zardetto’s NV Brut Conegliano Prosecco ($16) and NV Santa Margherita’s Prosecco di Valdobbiadene ($20). Made in the same way as Champagne (with a secondary fermentation inside the bottle to produce bubbles) and often with the same grape varieties (Chardonnay, Pinot Noir and Pinot Meunier), these crisp sparkling wines can be nearly as complex as Champagne—and are much less expensive. Pour the NV Mumm’s Napa Brut Prestige ($20) or NV Domaine Chandon Blanc de Noirs ($22) with salty or fried foods and white-meat chicken dishes. Red sparkling wines get their intense color from the skins of grapes. Their robust, fruity, earthy flavors tend to pair best with dishes that include dark-meat chicken, cheese or mushrooms. Lambrusco from Italy is the model for this style. Try the NV Medici Ermete Solo Reggiano ($15).